Click here for today's liturgy. 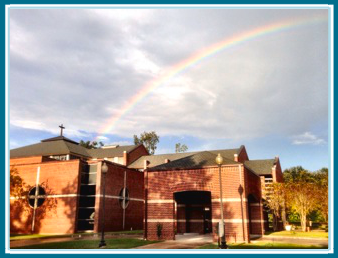 TUITION ASSISTANCE...We are pleased to offer you a convenient, online method to apply for financial aid through FACTS for ​Holy Ghost Catholic School. Click here to access the application. Application process begins Feb. 5, 2019. Application deadline is April 3, 2019 and Submission deadline is May 5, 2019. Do you enjoy singing? If so, the Holy Ghost choir has a seat for you! The choir sings at 9:30 mass every Sunday and rehearses for one hour on Wednesday evenings. You do not have to be a trained musician to participate, and anyone over age 13 is invited to join this ministry. If interested, please meet the choir in the chapel at 9:00 Sunday mornings, or email Jane Wear for more information. Would you like to become a member of Holy Ghost Church? registration to be complete. THANK YOU! Online Giving allows you to make contributions to Holy Ghost Church without writing checks or worrying about cash donations. This site lets you set up automatic contributions and change the timing or the amount of your gift at any time. Click here to update your family information and to check the amount of your stewardship (Must login using Head of Household's name).